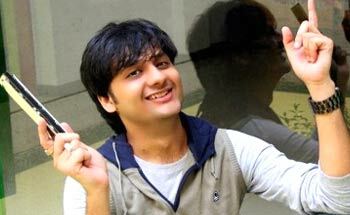 He is one of the most popular jocks of Radio Mirchi in the city of Ahmedabad. Extremely passionate about Gujarati language the jock has also undertaken several social initiatives on the station A columnist and movie critic on the weekends, a show host few days in a month, a stand up comedian, Radio Mirchi's Ahmedabad jockey RJ Dhvanit in conversation with Radioandmusic.com's Harpreet Khokhar. How did you kickstart your journey into the radio sector? about entering in the industry because the medium was in a very nascent stage and nobody knew about its future. But ultimately I took it up and developed my own style of RJing. In the first three months I was given the afternoon show after which I was given the evening show. Tell us more about your show on Mirchi? How have things evolved over the years? I did the evening show for the first three years in Mirchi called Bumper To Bumper before I shifted to my current morning Slot. As a performer, I have evolved with the medium over the three years I have been associated with it as much as the medium has also evolved in itself. In the initial few days, we experimented with several concepts few of which worked for us. We tried and introduced different formats including the One hour contest shows to increase interaction with the audience. I was also one of the first RJ to give movies reviews with sound bytes. How has radio evolved over the years? There was a lot of restriction on the content that was being aired on radio. A lot more awareness about the medium has been raised over the years. It has become a complimentary medium today where it has media partnerships with every on-ground event and even for television shows. Today there is a particular radio partner for most of the soaps operas on television spreading its reach even further. Content has undergone a lot of evolution in these years. Initially, we were only allowed to talk about films and music. Though Bollywood still remains our forte, we have become much more local with our content and language over the years and sometimes even give updates on the current events. RJs have become the face of the stations today. You think it is important for an RJ to be seen along with being heard? Personally I don't endorse visibility of RJ's so much. Radio has its own charm though adding the glamor helps a little. People have a particular image about the RJ's ans as much as we try we can never really match upto it. If the listeners cannot relate the appearance of the RJ with the image that they have formed then a sense of dissatisfaction creeps in. So radio's charm of pulling in the listeners through the voice should be maintained in my view. Though adding glamor by publicity wouldn't harm. You are also a musician tell us more about it? I have always felt that Gujarati community lacks an aesthetic value when it comes to performing arts in their regional language. I wanted to express today's generation feelings in Gujarati. While doing 'Garvo Chhu Gujarati Chhu' series on Radio Mirchi, I interacted with Manhar Udhas and Devang Patel, and we discussed that something new should be done in Gujarati music. There, the idea clicked in my mind to do something new, modern, and contemporary in Gujarati music. In the World Gujarati Conference held in New Jersey last year where I was the host, the organisers told me to compose a track for the event. I got together with my friend Chirag Tripathi and together we wrote the song and composed it. Parth Thakkar a twenty old music student later joined us. Three of us created tunes which is how the album 'Majja ni Life' happened after 11 months of toil. We wanted fresh sound that would appeal to the youth. Where do you see regional music heading in India? What is your view of FM stations ignoring regional music. Shouldn't they be given enough air time? Radio Mirchi as a station does play regional music. Our stations in South cater to the regional tastebuds. The problem with Gujarati music is that there is no demand for it. I took the effort to create that demand with the album. And it did top the chartbusters Ahmedabad where it was the top album for seven weeks. with this that the loss probability is a lot more. Piracy has increased so much and people do not want to legally buy music. Commercial viability of such albums is very uncertain Hence nobody dares to make regional albums. Even I have also just recovered the cost of making the album. How different is it to be a jock in a metro city to a comparatively smaller city? Personally I believe it better to be a big fish in a small town rather than being a small catch in a big town. No doubt in cities like Mumbai and Delhi the exposure is way too much. Lot of jocks have evolved from radio and moved to better prospects. There is no dearth of work and they get a lot of recognition. freedom with whole lot of listeners admiring you. Celebrity value increases for jocks in small towns. In metros people don't have time to follow the RJ's so much. You think RJs today act responsibly? entertainment which shouldn't always be superficial. Most of the RJ's today are not well informed which is why such instances happen. How much self censorship do you follow? I follow a lot of self censorship because when I joined there were a lot restrictions on us. We couldn't talk about religion since Ahmedabad is a very sensitive city. We couldn't even say anyth9ing on the political happenings. I use to write my own scripts and get them re checked. I have always been very disciplined with my content. What do you think is the future of radio sector with the onset of Phase 3? I forsee a lot of new stations in new cities and town with the onset of phase three. Radio has always been a part of rural areas since it is the only easily available entertainment source. It doesn't even demand attention. It is a great revenue opportunity for everyone and the sector will flourish providing great entertainment to the masses. MUMBAI: “The pessimist complains about the wind; the optimist expects it to change; the realist adjusts the sails,” this quote by William Arthur Ward stands true for ex-RJ and founder of Creative Antenna, Rahoul Bhaargava. MUMBAI: Red FM's newest sibling made a flashy official entry in Mumbai last week with a snazzy outdoor campaign. The funkily christened Redtro aims to woo the 30 and 40 year old Mumbaikar who grew up in the 1990s and still has a yen for music of that decade. Hitesh Sharma: "We are known for providing best creative radio solutions"
Entertainment Network (India), leading private FM radio operator, under the Radio Mirchi brand, has decided to hike its airtime rates in select key markets with immediate effect. Radio is repeatedly proving its efficacy and its efforts towards evangelizing the medium. In the last two months, three leading radio stations have announced the hike with an aim to add more value to clients and innovate better for listeners. The industry also avers that the hike is a reflection of the changing market dynamics, with retail and national advertisers, realizing the effectiveness of the medium. MUMBAI: The Malta edition of International Radio Festival has already created a buzz, prior to the actual event that will be held from 29 October to 4 November 2018. MUMBAI: Singer- music composer Salim Merchant's voice is truly magical. But, we get to hear his melodious voice only for a few minutes in his songs and the ends of his tracks leave us craving for more. Big FM gazed this hunger and roped in Salim to RJ a show.